Every Thanksgiving I make popovers. 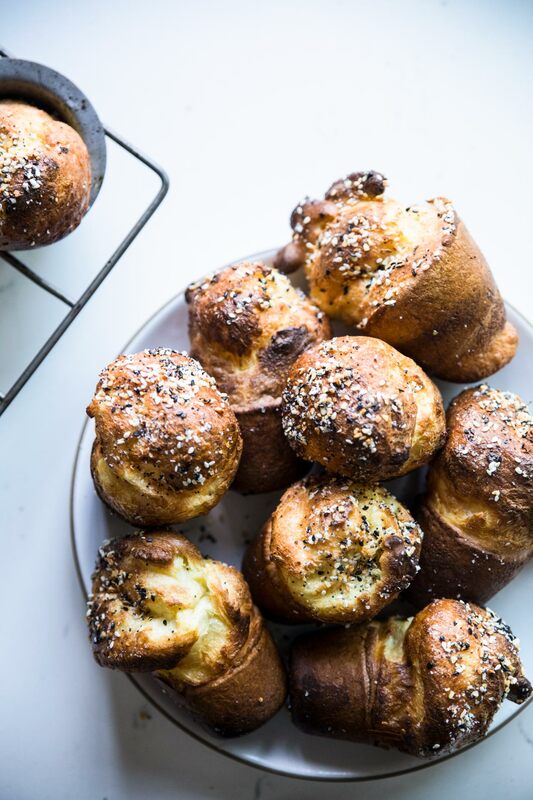 If you’re looking for an easy side dish that isn’t your ordinary dinner roll and take very little time to prepare, popovers are it! I’ve talked about popovers here before. They’re pretty much my favorite breakfast item ever. I love to tear them upon while they’re still hot and slather them in butter and jam. This time, I made them savory and topped the tops with everything seasoning– because everything is better with everything! Although popovers are incredibly easy to make, there are a few rules you must abide by to get large balloon-like and crispy popovers: (1) use room temperature ingredients (I usually leave mine out on the counter overnight); (2) as tempted as you may be, do NOT open the oven to peek at the popovers, you need all that heat trapped in the oven to give the popovers their lift; (3) serve immediately, they should be served fresh out of the oven (I like to put these in as my turkey or rib roast is resting)! If you don’t have a popover pan, you can use a muffin tin, although you won’t get as dramatic a rise as you do with a popover tin. 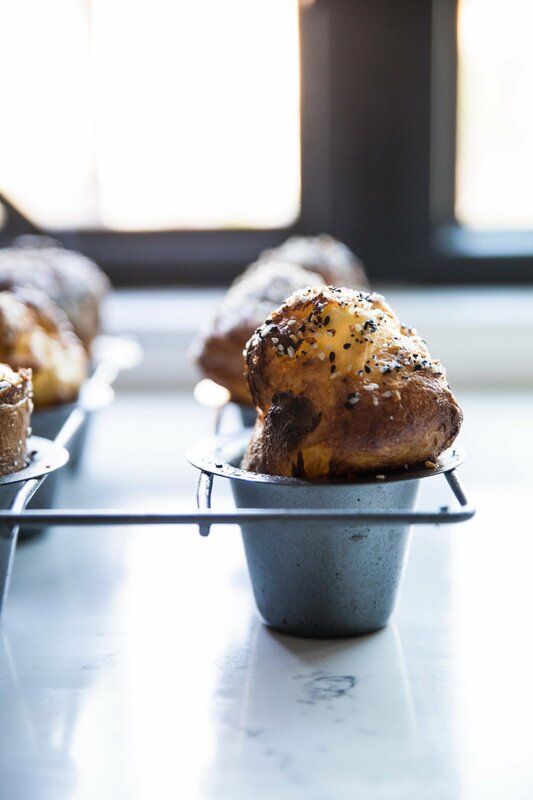 Popovers with an everything twist! Preheat the oven to 450 degrees. In a medium size bowl, whisk eggs and milk together. Add flour and whisk until incorporated and few lumps remain. Add melted butter and whisk until there are no more lumps. Add 1/4 tablespoon of vegetable oil in the bottom of each pan. Place your popover pan into the oven for 5 minutes until the oil gets hot and begins to smoke. Remove the hot pan and evenly pour the batter until it comes about 3/4 up pan. Pour quickly and place the pan back in the oven. Bake for 20 minutes and then turn the heat down to 350 degrees and bake for another 10 minutes. Remove the pan from the oven and remove the popovers lightly spraying the top of popover and rolling the sprayed top in a plate of everything seasoning. Use your fingers to sprinkle on any areas that aren't covered. Place the popover back in the popover pan and repeat with the remaining popovers. Place them back in the oven for about 2 minutes. Remove and serve. Love the idea and will make for Christmas Eve. Thank you so much !